A decade after the first cases of Aids are reported in the US (1991), an estimated 10 million people are infected with HIV worldwide. The Red Ribbon has become the international symbol of AIDS awareness and support, not only for those living with HIV, but for their families, friends and people who are fighting for equality and non-discrimination. The Red Ribbon Project was created by the New York-based Visual AIDS Artists Caucus in 1991, the individuals on the project wished to remain anonymous but wished instead to credit the Visual AIDS Artists Caucus as a whole in the creation of the Red Ribbon Project. They also wanted to ensure the image was copyright free, so that no individual or organization would profit from the use of the red ribbon as it’s ethos is for it to be used as a consciousness raising symbol, not as a commercial or trademark tool. First worn publicly by Jeremy Irons at the 1991 Tony Awards the ribbon soon became renowned as an international symbol of AIDS awareness, becoming a politically correct fashion accessory on the lapels of celebrities. At the Freddie Mercury Tribute Concert held at Wembley Stadium, London on Easter Sunday 1992, more than 100,000 red ribbons were distributed among the audience, with performers such as George Michael wearing one. The Red Ribbon continues to be a powerful force in the fight to increase public awareness of HIV/AIDS and in the lobbying efforts to increase funding for AIDS services and research and LASS encourage you to wear yours every day! 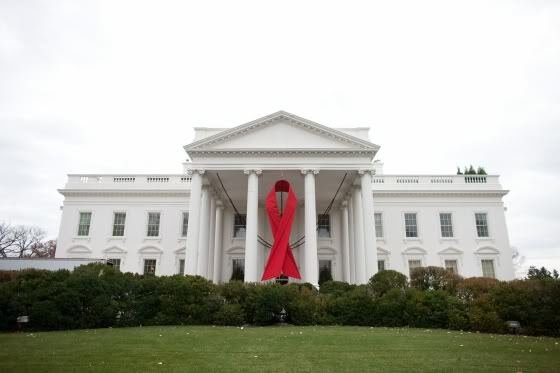 To symbolize the United States’ commitment to combat the world AIDS epidemic, President George W. Bush’s administration began displaying a 28-foot AIDS Ribbon on the White House’s iconic North Portico on World AIDS Day 2007. The display, now an annual tradition, quickly garnered attention, as it was the first banner, sign or symbol to prominently hang from the White House since Abraham Lincoln lived in the building. The largest peak in requests for HIV testing in the UK was observed in January 1991 when the character Mark Fowler, (of EastEnders), was diagnosed with HIV. Mark was an original regular character in the BBC series starting February 1985. Contracting HIV forced him to grow up fast and accept his responsibilities. He frequently found it difficult to accept the restrictions of the illness, which finally claimed his life in April 2004. Mark initially kept his secret hidden from everyone. However, as he and his friend, diane grow closer, he finally decides to tell her the truth about his HIV status in January 1991. He believes that he had come into contact with the virus through his girlfriend. Eventually, Mark’s relationship with Diane never becomes serious, not for her at least. She is a useful confidante however, and manages to persuade Mark to go for counselling at the Terrence Higgins Trust. (A real service you can access today, click this link for more information)! Mark initially turns on his male counsellor, relaying all his bitterness at being a potential “AIDS victim”, but eventually feels the benefits of discussing his status. During the summer, a study was published showing that HIV was transmitted much more easily through breast milk than had previously been thought but despite admitting that the news was discouraging , The World Health Organisation also said that women in developing countries should continue to breastfeed, as the threat to infant health from contaminated water was even greater than the threat from AIDS. Although the media was full of speculations about the state of Freddie Mercury’s health for a long time, he admitted to having the disease on 23rd November 1991. Within 24 hours after this announcement, he had fallen into a coma and passed away. He died of pneumonia in consequence of his HIV infection. He did not live to see the Olympic Games in 1992, which he composed the official anthem ‘Barcelona’ with opera singer Montserrat Caballé. 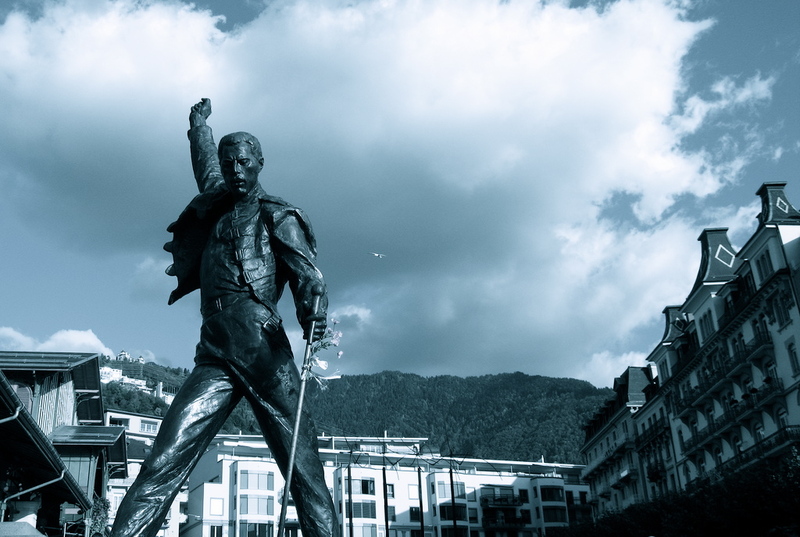 As one of the highest-profile victims of AIDS, Freddie Mercury’s death drew greater media awareness of the virus and started the fight to remove the stigma, discrimination and prejudice from a disease which could affect anyone. A fight which, unfortunately continues today in 2012. Magic Johnson, then an American professional basketball player who played point guard for the Los Angeles Lakers publicly announces that he is HIV-positive. After a physical before the 1991–92 NBA season, Johnson discovered that he had tested positive for HIV. In a press conference held in November, 1991 he made a public announcement that he would retire immediately and stated that his wife Cookie and their unborn child did not have HIV, and that he would dedicate his life to “battle this deadly disease”. – Magic continues to advocate HIV awareness today. By the end of 1991, around 450,000 AIDS cases had been reported but it was estimated that 10 million individuals had been infected with HIV. This entry was posted in Uncategorized and tagged AIDS, celebrities, entertainment, Freddie Mercury Tribute Concert, George W. Bush, hiv, Mark Fowler, red ribbon, research, science, United States, vacation, White House. Bookmark the permalink.